This dietary supplement contains live lactic acid bacteria. Three types of live microorganisms support your healthy life. Living, life-filled lactic bacteria support your daily health and beauty. 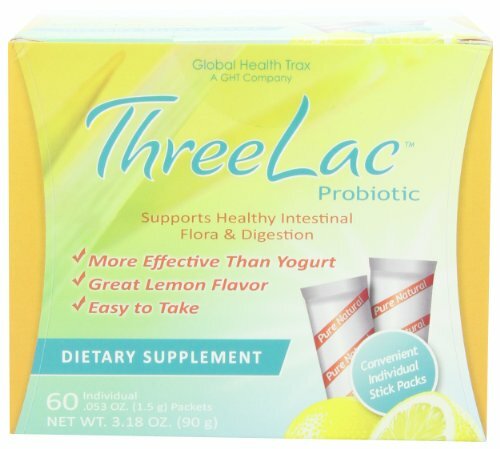 Threelac is a lemon-flavored, nutritional food supplement composed of three live bacteria: bacillus coagulans, bacillus subtilis and enterococcus faecalis. Additionally, Threelac contains fiber, yeast (as food for the bacteria), and vitamins, all added to support your daily health and wellness needs. Threelac is recommended not only for the maintenance of your daily health, but also to help address the digestion of those whose normal meals tend to be irregular and off-balance. (These statements have not been evaluated by the Food and Drug Administration. This product is not intended to diagnose, treat, cure or prevent any disease.) Threelac is manufactured in Japan.